KOKOMO, Ind - The Indiana University Kokomo Cougars women’s volleyball team is making strides, as evidenced by last week’s road win against Grace College. 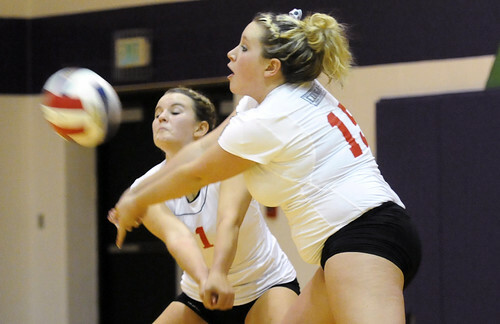 Liz Barney (15) and Krista Armstrong (1) keep the volley going. See More On Wednesday night, the Cougars faced off once more against the Lancers, this time on IU Kokomo’s home court at Northwestern High School. The result may not be considered as historic as the first win as the Cougars pushed Grace but came up short, losing in the four set match, 3-1. Coach Kristen Snoddy said things are headed in right direction for the young team. The first set was the proverbial slugfest with neither team giving any quarter. Neither team built more than a three-point lead until late in the set when Grace rattled off six points to make it 21-16. Shelby Spall and Jenna Pelling both scored winners for the Cougars in a three-point run to cut the lead to 21-19. Grace scored the next two points making it 23-19. Peling scored on a tip to make it 23-19 but the Lancers returned the favor, leaving them one point from the win. Trailing 24-20, the Cougars responded with ferocity worthy of their namesake. Fueled by points from Pelling and some Lancer errors, IU Kokomo stormed back to a 25-24 lead. Unfortunately for the home team, Grace was equal to the task and scored three straight points to take the 27-25 win. The Cougars shook off any effects from the loss in the second game, dominating the Lancers at the net most of the way. Led by Pelling and Spall, the Cougars raced to an 18-11 lead before Grace recovered. The Lancers closed the gap to 20-16 before the Cougars pieced together a 5-3 run to finish out the set and claim the 25-19 win. The third set saw the equally matched teams again battled to a near draw. Strong play on both sides of the net left the Lancers clinging to a 19-16 lead late in set. Grace tallied two points to make it 20-16. IUK, once again, rose to the occasion and ran off five consecutive points to take a 21-20 lead. Grace wasn’t to be denied, however, a 5-1 run finished the third set at 25-22. The fourth set was nearly all Grace as the Lancers cruised to an 18-8 advantage. Even if they were running out of gas, the Cougars weren’t going down without a fight. IU Kokomo pieced together an 8-1 run to cut the lead to 19-16. The Lancers stood their ground and IU Kokomo never got closer than 22-20. Three straight Lancer points finished the scoring and gave Grace the 25-20 win. Pelling led the way for the Cougars with 14 kills while Spall added 12. Rachael Williams continues to be the backbone of the offense at the setter position as she finished with 32 assists. On defense, Emily West led with 18 digs and Williams had nine. Pelling and Spall each had nine blocks on the night. The Cougars return to action on Sept. 23 at Ancilla College. IU Kokomo returns home on Sept. 29 to take on Indiana Tech with a start time of 7 p.m.